To apply for web space, go to SpartanWeb. Click on "Request Web Space", complete and submit the form. 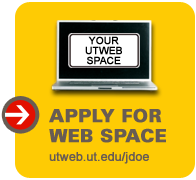 The UTWEB site provides web space for current UT students, faculty, staff and student organizations. Users of this service must abide by the UT Acceptable Use Policy. Each site is provided with 10MB of space. Maintenance, design and file uploads are the responsibility of the applying entity. Users can upload files to their server space with the FTP client of their choice. Questions regarding server space should be directed to the IT Help Desk at helpdesk@ut.edu.